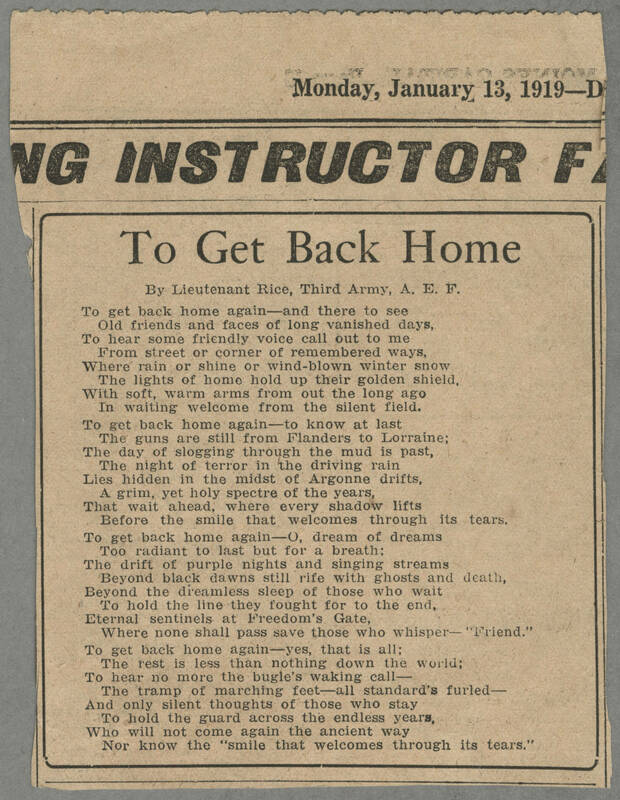 To Get Back Home By Lieutenant Rice, Third Army, A.E.F. To get back home again--and there to see Old friends and faces of long vanished days, To hear some friendly voice call out to me From street or corner of remembered ways, Where rain or shine or wind-blown winter snow The lights of home hold up their golden shield, With soft, warm arms from out the long ago In waiting welcome from the silent field. To get back home again--to know at last The guns are still from Flanders to Lorraine; The day of slogging through the mud is past, The night of terror in the driving rain Lies hidden in the midst of Argonne drifts, A grim, yet holy spectre of the years, That wait ahead, where every shadow lifts Before the smile that welcomes through its tears. To get back home again--O, dream of dreams Too radiant to last but for a breath; The drift of purple nights and singing streams Beyond black dawns still rife with ghosts and death, Beyond the dreamless sleep of those who wait To hold the line they fought for to the end, Eternal sentinels at Freedom's Gate, Where none shall pass save those who whisper-- "Friend." To get back home again--yes, that is all; The rest is less than nothing down the world; To hear no more the bugle's waking call-- The tramp of marching feet--all standard's furled-- And only silent thoughts of those who stay To hold the guard across the endless years, Who will not come again the ancient way Nor know the "smile that welcomes through its tears."